When Amir Khusro, the 13th century Indian poet, scholar, and musician, created an instrument called the tabla, did he imagine that it would be played by both men and women some day? If one were to examine cultural trends over the annals of Indian history, one would observe a predominance of male practitioners in the world of percussion arts while female practitioners have traditionally confined themselves to vocal and stringed instrumental music. Today, the Taalim School of Music in northeastern United States has broken boundaries in bringing to lovers of Indian music and the tabla in particular the world’s first all-female tabla ensemble—Taalika. Sejal Kukadia and Jin Won, who teach at the school, form the Taalika trio along with Heena Patel of Toronto. In an interview with Khabar, Sejal Kukadia and Jin Won, who are breaking boundaries and changing stereotypical perceptions about female musicians, discussed their emerging roles as noteworthy women tabla performers and teachers. Sejal, you are a contemporary American woman of Indian origin and Jin, you are of South Korean origin. Your passion is for an instrument from ancient India that has, until this generation, been played almost entirely by men. Any comments on this seeming improbability? Sejal: I am American, born and raised in upstate New York. My family is a conservative Gujarati family made up of doctors and engineers. And so the fact that I became a tabla player is certainly a remarkable rarity. However, after meeting Guruji, Pandit Divyang Vakil, and starting my training to become a tabla player, it did not feel at all different or strange. On the contrary, it felt completely normal and right. He always tells us (his students) that a higher order guides us in all that we do—perhaps it is destiny that I chose this path! Jin: I was born in South Korea. My father was an art lover and my sister sang for the choir and played the piano. I had no musical background or experience but was very active in theatre and was looking for a new medium to introduce into theatre. Indian philosophy and performing arts caught my attention. I was only in my twenties when I decided to travel to India to learn about Indian art and culture. I did not know how to speak English and started with lessons in English language and Kathak dance. After two years in Mumbai, I moved to Ahmedabad, where I met our Guruji, Pandit Divyang Vakil. He initiated me into tabla and also encouraged me to continue with Kathak dance since the two subjects are focused on rhythm. I ended up staying 13 years in Ahmedabad. My original goal of finding a new, experimental medium to bring to my interest in theater vanished. Kathak uses expressions and abhinaya and that is, now, my only link to the theatrical aspect of the art form. Life took me on a totally new path, different from what I had in mind when I left South Korea. Can you remember the first time you heard the tabla? And on that note, how did your interest in it first get established, and how did it grow to the extent it has grown now? Sejal: My parents introduced me to traditional Indian instruments as a kid. I initially started learning tabla in my hometown of Latham (in upstate New York) with a local tabla player who was a friend of the family. Through his encouragement, my interest in the instrument grew, and I started attending concerts by musicians such as Zakir Hussain and other legendary percussionists. But I knew that I wanted to study tabla in a formal and serious way and so I headed off to India during a summer break from college, with the sole mission of finding a tabla guru. Not just a “teacher,” but a guru. I was incredibly fortunate to meet Pandit Divyang Vakil in Ahmedabad, and within weeks, I moved to Ahmedabad to begin my full-time training. The training was intense, and the hours of practice were long, but I was happy to have this amazing opportunity to study under Guruji. In 2002, Guruji, myself, and one of Guruji’s American disciples, Loren Oppenheimer, started the Taalim School of Indian Music in north New Jersey. And this year we all celebrated the tenth anniversary of our institute! Did your Guru, Pandit Divyang Vakil, have other female students before you? 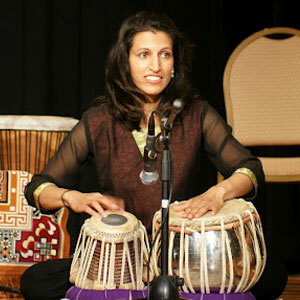 Sejal: Tabla playing has often been associated with strength and aggression. Our Guruji did have a few female students before us, but they did not go on to pursue tabla as their profession. Jin: I have consciously chosen to pursue a career in performing and teaching tabla and Kathak. You can say that I am married to them since they take all the time and energy I can give to them. It is heartening to see Sejal and now a third female tabla player, Heena Patel, have a similar deep interest and inclination towards tabla. We play together as a trio, and for us, it is both a serious pursuit and also a lot of fun. Jin, can you describe your views on Indian music as an outsider to it? Jin: Because of my Guruji, I realized how deeply spiritual Indian art is. Indian music is spiritual not because one hears a lot of religious and devotional bhajans but because everything in the world is based on vibration and Indian philosophers and musicians have studied this subject in great depth. Indian music has entertainment and technical components, but more than anything, it is spiritual in nature and elevates your heart and mind. Do you or your Guru feel that females might have some advantage or disadvantage in playing the tabla? Do you feel the feminine brings something different/new to the tabla? Sejal: In some regard, female tabla players have a slight advantage being that there are so few of us in the world. 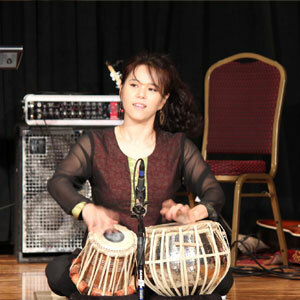 For example, I got the opportunity to perform in Divahn and Taalika (tabla ensemble), because I am a woman tabla player. However, when it comes down to it, if you are a good musician, whether male or female, you will be accepted and recognized by other musicians. Jin: Whenever I give performances, people come up to me and show their admiration. They appreciate me for taking up tabla as my instrument of choice in spite of being a female and of non-Indian origin. It seems to inspire them very much. Have you played or been recognized/acknowledged by ustads of the tabla world, such as Zakir Hussein? 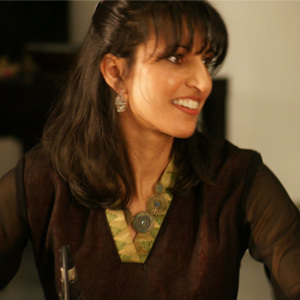 Sejal: I have written a textbook on the tabla (http://taalim.com/store/tabla-book/) and the book has been accepted by several maestros of tabla. In fact, three legendary tabla players, the late Pandit Sudhirkumar Saxena, the late Ustad Shafaat Khan, and Pandit Swapan Chauduri, have said some very nice comments, and these are included in the book. Jin, have you moved to the USA permanently or do you move between the U.S. and India and South Korea? Jin: My Guruji started the Taalim school in New Jersey, New York and Pennsylvania almost 10 years back. I moved to the U.S. in August 2011 and am here to teach Kathak and tabla at the schools. I want to expand our presence to other regions and to attract not just second- or third-generation Indians but a wider audience of potential tabla enthusiasts. I have also given performances in Kathak and tabla in several U.S. and Canadian cities. I do visit South Korea two or three times a year to see my family. Every country has its own charm. It seems you prefer tabla solos. What do you feel about tabla as an accompaniment? Are you open to performing in Indian classical orchestras? Or fusion bands? Sejal: I am mainly a soloist. However, I perform as an accompanist in the Middle-Eastern fusion band, Divahn. I have been with the band for about four years. The band is an eclectic group of musicians (cello, violin, conga, tabla, and vocals), and I play semi-classical rhythms and grooves to accompany the upbeat tunes. 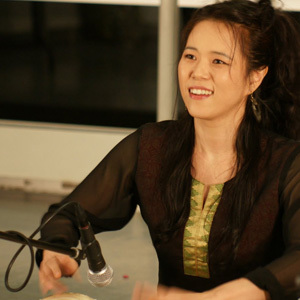 Jin, could you describe some of the challenges you face as a tabla/kathak performer and teacher in the U.S.? Jin: Finding opportunities for performance is not that easy—I always wish I could have more. When it comes to teaching, I find that students in the U.S. are into too many different after-school activities. I try and tell them and their parents that it is more important to focus on one or two activities instead of becoming a jack-of-all-trades. Tabla for instance, is a difficult instrument to master. Just like meditation, one must try and focus on one thing. I want to inspire my students to take up studying tabla/kathak with single-minded dedication. One needs a lot of physical and mental strength to study Indian art in a serious and purposeful manner. Do you feel the tabla world has accepted both of you as serious exponents? Sejal: As I am still very much a student, I have a long way to go on the road of classical music. As a faculty member at the Taalim School, I feel that I am accepted and recognized as a good teacher and a role model to young women who are studying tabla. We have several female students at our institute who say that one of the reasons that they started learning tabla was because they saw that the teacher was a woman! Jin: I feel similarly. I enjoy a wonderful relationship with my students and their parents. I am still not done learning everything there is to know about the tabla. Tabla is a very vast subject. It demands a lot of self- discipline and riyaz. I am committed to putting in all the effort it takes to mastering the instrument. Sometimes, I feel that one lifespan may not even be enough to master it.